A YOUNG Inishowen cancer patient got to do what thousands of others Donegal people wanted to do this week – she got her hands her on the Sam Maguire. 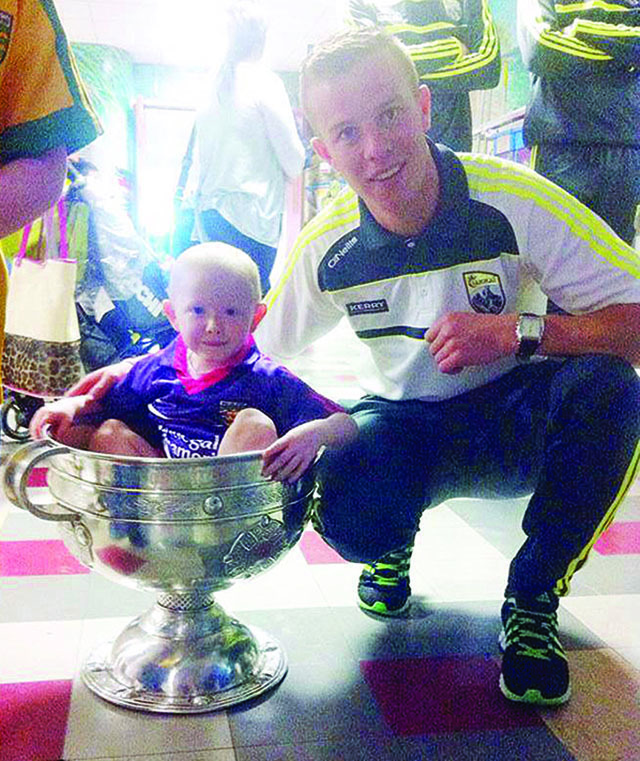 Three-year-old Muff girl Caraiosa Grant was undergoing routine chemotherapy treatment in Crumlin Hospital in Dublin on Monday morning when the All-Ireland Champions, Kerry, visited with the Sam Maguire cup. Caraiosa and the dozens of other young cancer patients who were undergoing treatment in the Dublin based hospital lit up when the Kerry players walked into their ward on Monday. Caraiosa’s mum Ethel Grant said the team were ‘really generous with their time’, making sure that all the young patients got their chance to see the famous trophy. “They really cheered up the place,” said mum Ethel. “They were so generous with their time and Caraiosa’s four brothers and sisters all got to spend time with them. Caraiosa, the young daughter of Cathal and Ethel Grant from Ardmore, Muff, was diagnosed with leukaemia last November and has been undergoing chemotherapy in St. John’s Ward in Crumlin for the past while.